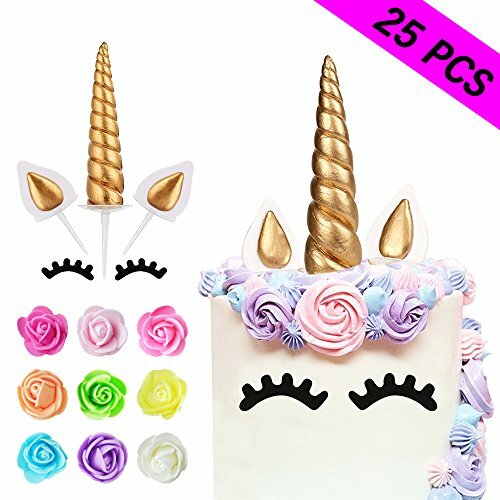 Unicorn Cake Topper, Reusable Unicorn Horn, Ears, Eyelashes and Flowers Party Cake Decoration for Birthday Party, Baby Shower, Wedding by TRAONOR at Good Time Donuts. MPN: 43237-2. Hurry! Limited time offer. Offer valid only while supplies last. Cake is NOT INCLUDED, cake topper & flowers is NOT EDIBLE and can't be put into microwave. High quality: Made by high quality safe material, tasteless, nontoxic, NOT EDIBLE. Package Info: 1 unicorn horn, 2 ears, 2 eyelashes and 20 flowers. Ideal for birthday and wedding cake to celebrate. The unicorn birthday cake topper is designed with creativity and imagination, and they are reusable if you keep them well. Wide applications: suitable for baby shower, wedding, and birthday party for boys or girls, necessary decorations for your cake and make it cute and full of fun, with shiny eyelashes, can take on a vivid image of your cake. If you have any questions about this product by TRAONOR, contact us by completing and submitting the form below. If you are looking for a specif part number, please include it with your message.